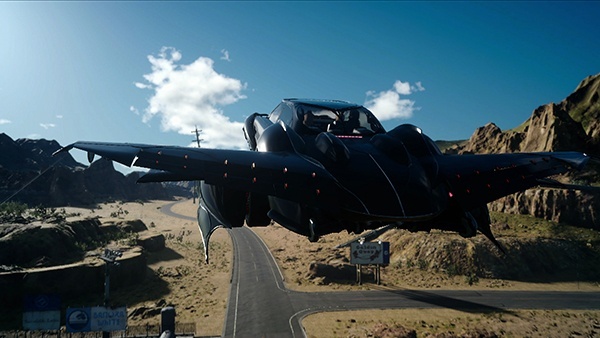 Regalia Type-F is a Ride in Final Fantasy XV. It is the flying version of the Regalia. The Regalia Type-F is a sophistocated piece of tech that allows you to travel over the world with a lot of freedom. It features take off and landing mechanics, which must be executed correctly or the party will die and you will have to retry. Acquiring this vehicle is not required to complete the main story, but their are certain areas of the game that can only be accessed via flight. The Type-F will not run out of fuel while in flight. TheType-F is an upgrade you can make to the base car, the Regalia. When you go past Formouth Garrison at any point after Chapter 8, you’ll receive a quest to infiltrate it. When you complete it you will earn the Strange Engine. When you get to Chapter 15, you can have Umbra warp you back to Lucis. Doing this will give you a quest called Into Unknown Frontiers. Go see Cindy at the garage then and she will upgrade the Regalia to the new and improved flying version!